Hematocrit (Hct) (%) 15 - 65 0.6% C.V.
Hemoglobin (Hgb) (g/dL) 5.0 - 20.0 0.6% C.V.
WBC Count (x 10⁹/L) 2.0 - 30.0 6.3% C.V.
Granulocyte (x 10⁹/L) 0.5 - 29.7 < 3.3 S.D. Lymphocyte/Monocyte Count (x 10⁹/L) 0.5 - 29.7 < 3.3 S.D. Platelet Count (x 10⁹/L) 80 - 600 4.4% C.V. The QBC Autoread Plus has a decade-long proven track record of being extremely reliable in the world’s harshest environments. From medical tents in Iraq and Afghanistan to research facilities in Antarctica, the Autoread Plus handles the worst conditions imaginable, time and time again. The Autoread Plus Dry Hematology System offers a durable, cost-effective option for conducting hematology testing in virtually any setting. 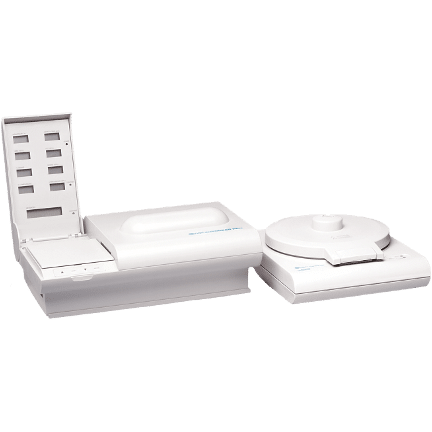 The Autoread Plus System, which consists of a reader, a centrifuge, and an external printer (US only), uses patented dry hematology technology to deliver a 9-parameter, 2-part differential. This results in many benefits for the user. Unlike competing products, the Autoread uses no liquid reagents. With no liquid reagents, lab storage requirements are minimal. Little maintenance is required and there is no need to clean or replace internal parts. The only waste products generated by the Autoread are the QBC Tubes themselves – which are much easier to dispose of than dangerous biohazard reagent chemicals. The Autoread System is the most durable CBC analyzer on the market. Its dry hematology technology and hard plastic frame make it suitable for conducting testing in even the harshest conditions. Because of the unique QBC dry reagent technology, the Autoread can be transported and quickly deliver results in any location without concern for leaking or damage. Setup time is minimal, as the Autoread is always ready to provide fast, accurate hematology analysis. Learning to use the Autoread is easy. After preparing a blood sample using a QBC Tube, simply centrifuge the tube for five minutes at 12,000 RPM and then place it in the reader. Results will print out automatically using an attached printer. Office personnel can be easily trained to use the Autoread, making the most of any office’s limited resources. The Autoread measures nine important CBC hematological parameters from venous or capillary blood samples: hematocrit, hemoglobin, MCHC (Mean Corpuscular Hemoglobin Concentration), platelet count, white blood cell count, granulocyte count and percentage, and lymphocyte/monocyte count and percentage. Clinical trials have demonstrated that the accuracy and precision of the Autoread System correlate well to accepted standard methods. The Autoread is exceptionally reliable. The system is permanently calibrated during manufacturing, so the user needs to only run a basic daily calibration check to verify satisfactory performance. Because of the unique QBC dry technology the Autoread can deliver reliable results using on a finger stick blood sample. The technology at the heart of the Autoread is a process known as Quantitative Buffy Coat (QBC) analysis. This process is based on the physiological phenomenon in which the differing densities of blood components will cause them to separate into layers when centrifuged at a high rate of speed. Click here to watch a video on Dry Hematology technology. QBC tubes, including the many varieties available for the Autoread, take advantage of this phenomenon in two ways. First, through the use of a small plastic float with the approximate density of platelets and white blood cells (the “buffy coat”), those usually small layers can be physically expanded for greater analysis. Second, a metachromatic acridine orange stain coating the inside of the tubes stain lymphocytes and monocytes green, platelets yellow, and granulocytes orange, making the difference between layers visible – even to the naked eye. Once a sample has been centrifuged, the Autoread utilizes a dual light source and optical detector to read the results of the test. Once complete, the Autoread prints the results to an attached external printer. Electro-Mechanical Safety Interlock – Lid must be closed and latched before the motor can be energized. Lid remains locked until the rotor stops. From a printer compatibility standpoint, Autoread instruments running the standard software are the hardest to support due to their reliance on parallel printing. Nowadays, it is fairly uncommon to find new printers supporting this type of connectivity. However, two out of the seven printers tested worked with the instrument. The five printers that are not compatible were simply due to the fact that they did not offer parallel connectivity. Is the Autoread considered CLIA waived? Currently, all of the QBC Systems are moderately complex. How often do I have to run external controls on the QBC Autoread Plus? Traditional quality controls consist of running at least two levels of external control material each day of patient testing. My controls arrived warm (ice packs were melted); can I still use the controls? What type of sample is required for QBC Autoread testing? Whole blood samples collected from either a capillary fingerstick or a venous blood draw (EDTA purple top tube). How much blood is required to test on the Autoread systems and what collection method should be used? What tube types can be used with the Autoread System? AccuTube, Standard Capillary, or Standard Venous tubes. How long can a venous sample be stored prior to testing on the Autoread System? This is dependent on each individual tube type. Check the tube package insert for each specification. Can a sample be processed more than once in the Autoread? Yes – once centrifuged, the QBC tubes can be analyzed more than one time. The tube must be stored in an upright position and be stable at room temperature for up for up to four (4) hours. QBC tubes, however, should NOT be centrifuged more than one time. How can I get results from my QBC Autoread into other external systems (e.g. EMR, LIS, etc.)? Drucker Diagnostics recommends contacting Apex Healthware. Apex Healthware is a developer of affordable HL7 interfaces and laboratory information systems. What printers are compatible with the QBC Autoread Plus? Brother HL-5240, Brother HL-5250DN, and Brother HL-5340D. Other printers may work with the system if they use the Epson language (ESC/P2/LQ). The Autoread ran the test but the results are not printing. Why? Power off the printer and follow the instructions in the Operator’s Manual for resetting the print format. Power on the printer and test the cal rod or a sample. Can I reprint the results on the QBC Autoread? If the tube is still in the instrument, press the ‘Next’ button. What causes a “Sample Error 20” or “Buffy Coat Unreadable” errors? These errors are generally sample related. Ensure that venous samples are well mixed prior to loading the QBC Tube. Invert the venous tube 12-15 times prior to loading the tube or 5 minutes on a mechanical rotator. For capillary samples, proper collection technique is extremely important. Warming the finger, using a blade lancet, wiping off the first drop of blood, and refraining from excessive squeezing of the collection area will yield a good sample. Certain illnesses and disease processes may contribute to these errors as well. If an illness or disease is thought to be the cause of the error, the patient should be tested via another method. Contact Technical Support for any question. I am seeing discrepancies between the results on the QBC and the results from the reference lab. Why? The results from two different CBC methodologies will rarely be exactly the same. Confirm that the results are from the same sample. If one set of results is from a capillary sample and the other set is from a venous sample, the results could vary significantly. If the results vary between multiple capillary or multiple venous samples, it could be due to differences in the times of collection technique. If the results are from the same venous sample, remix the venous tube at least 12 – 15 inversions prior to sampling. Confirm that the test was performed within the acceptable time limit and that the venous sample was stored according to the manufacturer’s recommendation. Can I run Veterinary samples on the Autoread? It is not recommended to run animal samples on the instruments designed for human testing. IDEXX has the QBC Veterinary instruments with the appropriate software and tubes for animal samples. Contact IDEX at +1-800-248-2483. For all service inquiries, please contact the Drucker Diagnostics Technical Service Department at +1-866-265-1486 (US only) or support@druckerdiagnostics.com. Our Technical Support Representatives are available Monday – Friday, 8:30 a.m. to 5:00 p.m. (EST). Otherwise, please contact your nearest Drucker Diagnostics office for assistance. Drucker Diagnostics includes a one-year limited warranty from the date of the original shipment on all Autoread Plus Analyzers AND QBC Centrifuges. In the unlikely event that an Autoread Plus Analyzer or a QBC Centrifuges needs repair due to defects in materials and workmanship, the warranty covers all parts and labor needed to repair both instruments at no cost to the user. The Autoread Plus printer is covered by the terms of its own manufacturer’s warranty. Please consult Appendix D of the Autoread Operator’s Manual for more details on the terms of the warranty. Beyond the initial one-year warranty, QBC Diagnostics offers two additional annual service agreement programs, the Single Swap and Double Swap Service Agreements, each of which may be contracted for one (1) or two (2) years. With the Single Swap Service Agreement, Drucker Diagnostics will simply replace the user’s broken Autoread Plus system with a refurbished system at no additional cost to the user. With a Double Swap system, Drucker Diagnostics will provide a temporary replacement Autoread Plus while your Autoread Plus system is repaired and then returned back to you. For more details on these service agreements, please consult the Annual Service Agreement Programs document and the Service Agreement Renewal form. There are no customer-serviceable internal parts on the Autoread Plus Analyzer. Calibration adjustments, failure of internal lamps, or mechanical-electrical problems must be referred to a qualified Drucker Diagnostics service technician. The only replacement parts currently available for the Analyzer are external parts such as the power pack, line cords, and, in extreme cases, the software cartridge. Consult the Product Description List for ordering information on these parts. There are no customer-serviceable parts on the Power Pack. The unit, however, is protected by internal overload and thermal fuses. If the Power Pack fails to supply DC outputs to the analyzer, check the electrical line to the receptacle that supplies current to the Power Pack before requesting service. To order a replacement Power Pack or line cord, consult the Product Description List for ordering information on these parts. For information on service and repair for the QBC Centrifuge, please consult the operator’s manual. Blood leakage or failure of the QBC Pipetter to aspirate blood to the correct level may indicate that the Pipetter barrel is worn or should be replaced. To order a replacement Power Pack or line cord, consult the Product List page for ordering information on these parts. CLIA is an acronym for Clinical Laboratory Improvement Amendments. It sets forth uniform quality standards for laboratories and applies to all entities that perform tests for health purposes on human specimens. CLIA requirements are based on the complexity of tests performed (waived, moderated, or high). QBC hematology systems, such as the Autoread Plus, are considered moderate complexity test systems and therefore must meet quality requirements for moderately complex training. A procedure manual is a detailed sequence of activities showing how the test procedure is to be performed. It breaks down the test procedure one step at a time. You may utilize the Autoread Plus Operator’s Manual as your procedure manual if it is your policy to do so. Please ensure personnel are informed that they must follow the procedure as stated in the Operator’s Manual for performing the test. The procedure must be approved and signed by the Laboratory Director. CLIA specifies that a physician (MD or DO) serving as Laboratory Director must have at least one year experience supervising moderately complex testing OR complete a 20 credit course. This course can be completed online at www.medicine.uiowa.edu/cme/clia/. The Lab Director can also attend a 2.5 day workshop provided by COLA (please visit www.cola.org for dates and times). Additionally, individuals with a Bachelor’s degree and two (2) years of laboratory experience PLUS two (2) years of supervisory experience, or a Master’s degree and one (1) year experience PLUS one (1) year supervisory experience, also qualify to direct a moderately complex laboratory. Note: A single person may fill the position of Lab Director, Clinical, and Technical Consultant. Note: One means of these quality standards is through the use of internal and external quality checks, as appropriate. Liquid controls are available for the Autoread Plus through Drucker Diagnostics. Traditional quality controls consist of running at least two levels of external control material each day of patient testing. Drucker Diagnostics also offers an online Inter-Lab Quality control (ILQC) program to provide monthly peer comparisons with statistical evaluation of your results. To access this program, please click here. CLIA requires inspections every two years. The inspections are non-punitive unless there is failure to correct deficiencies. Laboratories may also choose another CLIA approved accrediting agency, including COLA (www.cola.org), CAP (www.cap.org), or JCAHO (www.jcaho.org) to conduct the inspections. These organizations will assist you in preparing your laboratory for inspection, including support and training. Fees vary, so please visit each individual site for further information on the services they provide. To apply for CLIA certification, or to change Certificate Type, please consult the following website: www.cms.hhs.gov/cmsforms/downloads/cms116.pdf. Please note that your completed CLIA application should be forwarded to the address of the local State Agency for the state in which your laboratory resides. You should also contact this State Agency for additional forms that may be necessary to complete the registration process. For a listing of contact information by state, please go to the following website: https://www.cms.gov/Regulations-and-Guidance/Legislation/CLIA/Downloads/CLIASA.pdf. QBC Autoread Plus and Systems have been in use, globally, for over 25 years with active installations on every continent, including Antarctica. There are over 15,000 active hematology systems worldwide and at least 1,500 fluorescent microscopy systems using Drucker Diagnostics’ Malaria, Parasitology, and TB kits. If you would like references for any of our innovative solutions from users near you, please contact us. “The QBC Autoread Plus is a durable workhorse. We’ve used the unit for about 3 years in remote jungle locations and our newer stationary health clinic in the Bolivian Amazon. The unit provides valid and reliable results and requires relatively low maintenance. It is also extremely user-friendly. Although we do not have a high patient volume (we average roughly 10 patients per day), the QBC Autoread Plus has outlasted nearly all of our other laboratory equipment. I highly recommend this product for analysis of hematocrit, hemoglobin, platelet count, and differential cell counts.